I wasn't kidding when I told you that I've been completely obsessed with camel coats. I fully admit to stalking Forever 21's website after seeing this coat in several print ads (I also love it in grey and black!). It finally became available a couple of weeks ago and I instantly pounced on it. 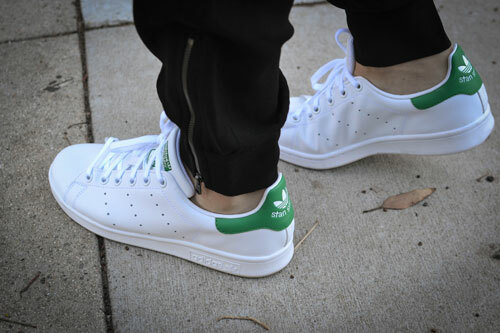 Oh, and yes, the Stan Smith's happened too. What can I say...I have a major problem when it comes to sneakers. Lovely! You pull off street style with the coat effortlessly. I'm working on getting the shipping wrinkles out of mine, but I definitely love it. I also love that it's light weight, not adding too much bulk. Thanks so much Jenn! Do you have a clothing steamer? It works like a charm on getting the wrinkles out. You know, I know I need to get one. I keep talking about it. I just need to do it. Right now I use the old hot shower approach which really doesn't do the best job! So effortlessly chic! Love the jacket! I like this casual outfit. I'd like to see my sister(23 years old) dressed like this.